As the earth warms, the melting of the earth’s two massive ice sheets—Antarctica and Greenland—could raise sea level enormously. If the Greenland ice sheet were to melt, it would raise sea level 7 meters (23 feet). Melting of the West Antarctic Ice Sheet would raise sea level 5 meters (16 feet). But even just partial melting of these ice sheets will have a dramatic effect on sea level rise. Senior scientists are noting that the Intergovernmental Panel on Climate Change (IPCC) projections of sea level rise during this century of 18 to 59 centimeters are already obsolete and that a rise of 2 meters during this time is within range. 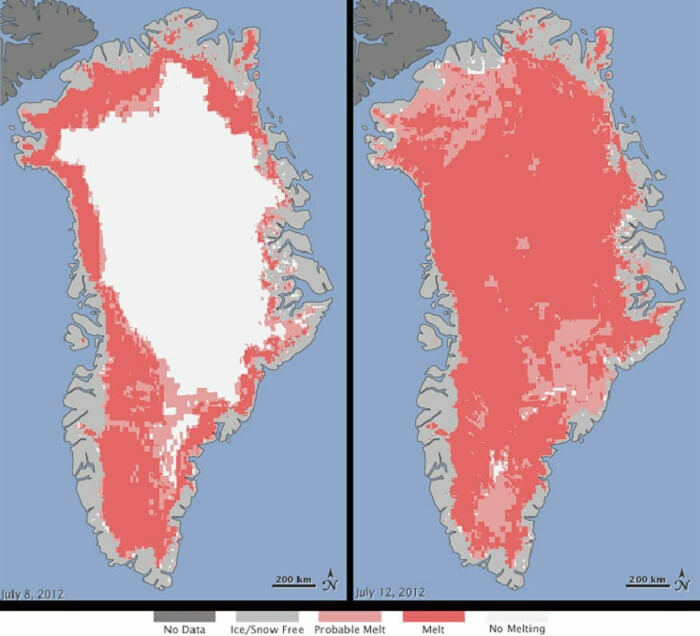 As I note in Plan B 3.0: Mobilizing to Save Civilization, assessing the prospects for the Greenland ice sheet begins with looking at the warming of the Arctic region. A 2005 study, conducted by the Arctic Climate Impact Assessment (ACIA) team, an international group of 300 scientists, concluded that the Arctic is warming almost twice as fast as the rest of the planet. It found that in the regions surrounding the Arctic, including Alaska, western Canada, and eastern Russia, winter temperatures have already climbed by 3-4 degrees Celsius (4–7 degrees Fahrenheit) over the last half-century. The ACIA report described how the retreat of the sea ice has devastating consequences for polar bears, whose very survival may be at stake. A subsequent report indicated that polar bears, struggling to survive, are turning to cannibalism. Also threatened are ice-dwelling seals, a basic food source for the Inuit. Scientists are concerned that “positive feedback loops” may be starting to kick in. This term refers to a situation where a trend already under way begins to reinforce itself. Two of these potential feedback mechanisms are of particular concern to scientists. The first, in the Arctic, is the albedo effect. When incoming sunlight strikes the ice in the Arctic Ocean, up to 70 percent of it is reflected back into space. Only 30 percent is absorbed as heat. As the Arctic sea ice melts, however, and the incoming sunlight hits the much darker open water, only 6 percent is reflected back into space and 94 percent is converted into heat. This may account for the accelerating shrinkage of the Arctic sea ice and the rising regional temperature that directly affects the Greenland ice sheet. If all the ice in the Arctic Ocean melts, it will not affect sea level because the ice is already in the water. But it will lead to a much warmer Arctic region as more of the incoming sunlight is absorbed as heat. This is of particular concern because Greenland lies largely within the Arctic Circle. As the Arctic region warms, the island’s ice sheet—up to 1 mile thick in places—is beginning to melt. The second positive feedback mechanism also has to do with ice melting. As the surface begins to melt, some of the water filters down through cracks in the glacier, lubricating the surface between the glacier and the rock beneath it. This accelerates the glacial flow and the calving of icebergs into the surrounding ocean. The relatively warm water flowing through the glacier also carries surface heat deep inside the ice sheet far faster than would simple conduction. At the other end of the earth, the 2-kilometer-thick Antarctic ice sheet, which covers a continent about twice the size of Australia and contains 70 percent of the world’s fresh water, is also beginning to melt. Ice shelves that extend from the continent into the surrounding seas are starting to break up at an alarming pace. The International Institute for Environment and Development (IIED) has analyzed the effect of a 10-meter rise in sea level, providing a sense of what the melting of the world’s largest ice sheets could mean. The IIED study begins by pointing out that 634 million people live along coasts at or below 10 meters above sea level, in what they call the Low Elevation Coastal Zone. This massive vulnerable group includes one eighth of the world’s urban population. One of the countries most vulnerable is China, with 144 million potential climate refugees. India and Bangladesh are next, with 63 and 62 million respectively. Viet Nam has 43 million vulnerable people, and Indonesia, 42 million. Others in the top 10 include Japan with 30 million, Egypt with 26 million, and the United States with 23 million. The world has never seen such a massive potential displacement of people. Some refugees could simply retreat to higher ground within their own country. Others—facing extreme crowding in the interior regions of their homeland—would seek refuge elsewhere. Bangladesh, already one of the world’s most densely populated countries, would face a far greater concentration: in effect, 62 million of its people would be forced to move in with the 97 million living on higher ground. Not only would some of the world’s largest cities, such as Shanghai, Kolkata, London, and New York, be partly or entirely inundated, but vast areas of productive farmland would also be lost. The rice-growing river deltas and floodplains of Asia would be covered with salt water, depriving Asia of part of its food supply. In the end, the question is whether governments are strong enough to withstand the political and economic stress of relocating large numbers of people while suffering losses of housing and industrial facilities. The relocation is not only an internal matter, as a large share of the displaced people will want to move to other countries. Can governments withstand these stresses, or will more and more states fail? Adapted from Chapter 3, “Rising Temperatures and Rising Seas ,” in Lester R. Brown, Plan B 3.0: Mobilizing to Save Civilization (New York: W.W. Norton & Company, 2008), available for free downloading and purchase at www.earthpolicy.org/Books/PB3/index.htm. So what year can I take a sail boat across the artic without hitting “any” floating ice? Do not give me any weasle words such as “might” or “could”. Give me a year that you will stake your reputation on. Forced Migration Review 31 has 38 articles – not covering the science as such, but the policy and humanitarian consequences of changes in the climate. I’m researching a story right now on the Newtok community of Alaska and their relocation due to rising river and sea levels. Thanks for this great post!